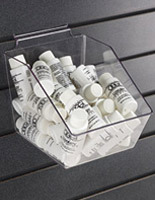 This acrylic container for slatwall systems features a simple universal clip-in design that accommodates most slotted display fixtures. 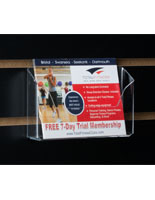 Each clear plastic bin is 10" wide and 6.25" deep, with 3.75" walls to showcase merchandise or supplies on gondolas, endcaps, floor stands and wall panels. 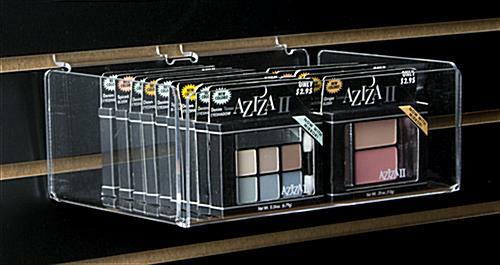 This versatile lightweight container for slatwall systems is easy to attach, fill, and move as necessary, making it a great choice for trade shows as well as in-store displays. 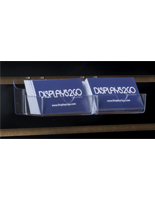 This display bin features an open-flange design with open corners that allows full visibility. 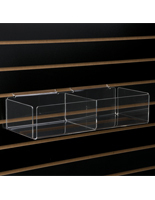 This 10" wide container for slatwall systems is ideal for holding retail goods, storing supplies, and displaying specialty merchandise. 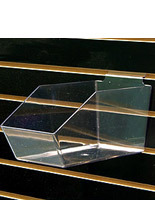 The clear construction is a superior way to attract customers in high traffic areas. 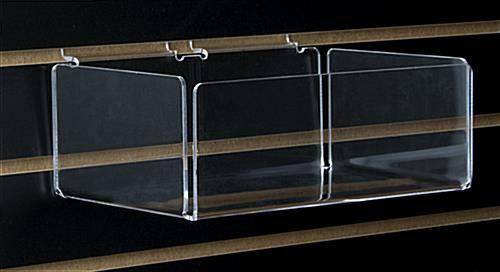 This transparent container for slatwall systems can be used alone, in banks, or as part of modular displays. The simple clip-in design fits most slotted fixtures and works great on gondolas, endcaps, wall panels, and freestanding fixtures alike. 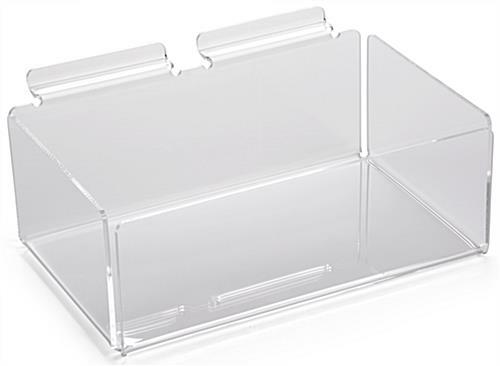 This lightweight clear plastic container for slatwall systems is an economical way for any business or organization to showcase and store supplies and merchandise in retail outlets, offices, showrooms, and at off-site trade shows and other events. 10.0" x 3.8" x 6.3"